I thought that after I equipped my home gym with free weight machines and sold my soloflex, that my days of using rubber for resistance were over. Not so fast! Bodylastics caught my attention. 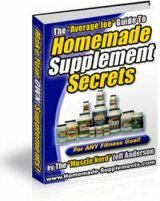 After thoroughly researching their product by reading many Bodylastics TO Super Strong Man Edition review, which by the way, are very positive across a wide spectrum of fitness related forums, I decided to get TO's super strong man edition. Why did I get this when I have all kinds of free weight machines and accessories, you ask? Changing up the routines works for me. It keeps me looking forward to my next workout. My first impression upon opening the box was that this was one well made product; I did not expect some of the bands to be so thick! I mean, on the bodylastics website they say the bands are made out of surgical grade elastic tubing. What do you think of when you hear the words surgical tubing? Clear plastic tubes with a small diameter, right? The bodylastic tubes are made to last. Attached to each end of the four foot band is an aluminum carabineer clip with the weight equivalents printed right on them. It looks like Bodylastics reworked how the carabineer clip was attached to the band. In some of their workout videos, they are using a band with a black clip. This is their new and improved way to attach the clip. 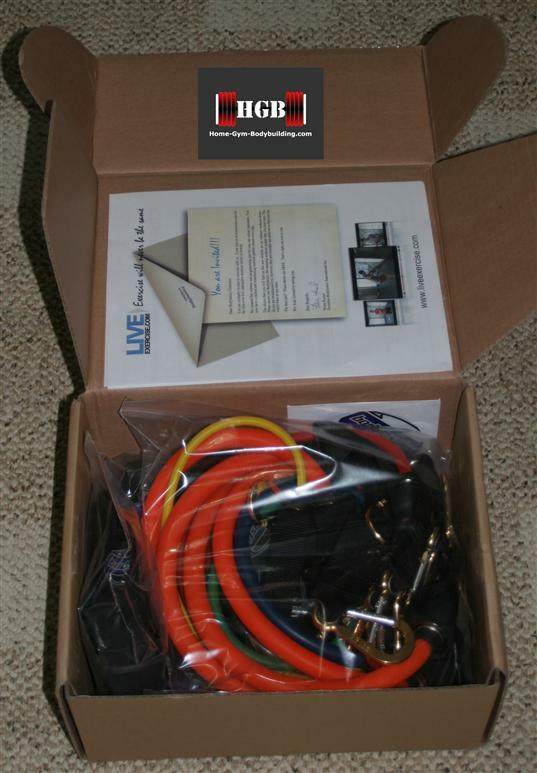 To use the system, you attach the bands to any door using a door anchor. This anchor enables the bands to be safely attached to the top, side AND bottom of the door. The very first time I used the anchor, my hollow core door made a creaking sound when I put tension on the bands; the door did not split or break however. The door anchor is surprisingly strong and holds good with no marks on the door or molding. 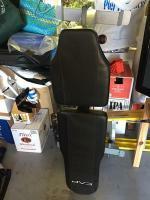 The handles and ankle strap are nicely padded and well made. No issues here. 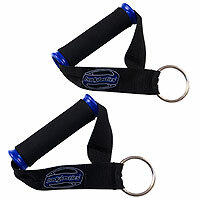 You can also use the ankle straps around your wrists thereby effectively taking your grip out of certain lifts. As for the exercises themselves, Bodylastics provide an extensive user book, with 76 pages and over 126 exercises and even sport specific routines. 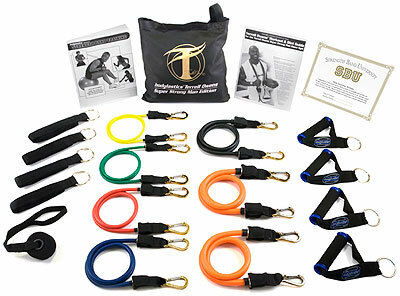 With the TO set you also get the circuit training DVD. This has an additional three, ten minute full body workouts. The TO set comes with a FREE lifetime tuition to SBU, or Strength Band University. This website shows you how to perform over 140 exercises. Bodylastics spent a tremendous amount of time researching and developing strengthbanduniversity.com because it is packed with so many exercises, you will never get bored. There are three complete workout programs for beginner, intermediate or advanced. The intermediate program consists of seven exercises, completed in circuit fashion. Between each exercise, I jump on the Schwinn Airdyne and ride for at least a minute. This is a very good strength/cardio workout. Another website by Bodylastics is liveexercise.com. Bodylastics bills it as "the first live interactive exercise channel in history". The best part of liveexercise.com is that all of the exercise shows and programming are FREE!! All you need is some exercise bands (they recommend Bodylastics, duh!) Check it out. Will Bodybuilders use rubber bands? First of all, your muscle does not know whether you are lifting a free weight, a weight stack from a machine or stretching elastic exercise tubes. It only knows that it is working against resistance, not what type of resistance. Some lifters feel bands offer inconsistent resistance throughout the whole rep range motion. And they are right. Using the biceps curl as an example, there is almost no tension at the bottom of the rep, moderate tension in the middle of the lift, and extreme tension at the top of the curl. "The typical Westside Chains are 45lbs each, causing a total of 90lbs of extra weight at the lockout. For example if you have 225 on the bar with the Westside chains, you will be holding 305 at lockout and only 225 off your chest. As the weight comes up to the 25% phase of the lift you should be moving 250, at the half way point 275 and at the finish 305. You are literally overcoming "EVERY" sticking point during the full range of motion of the bench press. "You see normally in benching off our chest, we lose speed coming off of our chest and it hurts our lockout. With chains we are now forced to build explosion off our chest and greater lockout power. And using chains on other exercises like the squat and deadlift are no different. " Isn't this what bodylastics bands do? They start off easy, get harder towards the middle of the rep, and then the max resistance is at the very top of the rep; exactly like chains! 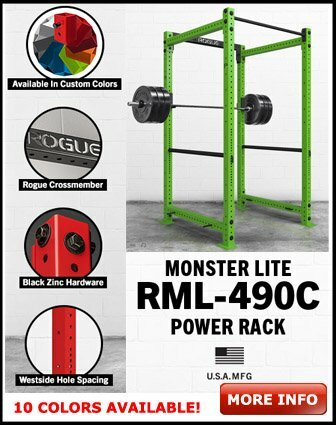 I am planning to attach the Bodylastic bands to my barbell, but I haven't found a way to safely attach the bands to my powertec power rack. You can also increase the resistance throughout the whole range of motion by shortening the band by standing on it with your feet farther apart, or by wrapping the band around a single foot. The motion of the rep with a band is something you have to experience. The motion is smooth and easy on your joints. Unlike free weights, elastic resistance does NOT create momentum. It's momentum that causes so many injuries; the weight keeps moving, but the ligaments and tendons do not. I used to travel for work, and the type of hotel gyms I worked out in ranged from fully equipped with Life Fitness machines and dumbbells to barely equipped with an old ratty elliptical next to a gym with a weight stack that could barely slide up and down on rusty rods! Usually hotels focus on cardio - providing treadmills and elliptical - but have neglected strength training. During prime hours the hotel fitness center can be too full, or just full of kids playing around with the equipment. This is where Bodylastics truly shine! Your room's door is always available and most hotel rooms have enough space for you to get a really good workout with the bands. The bag that comes with Bodylastics systems is a 13 or 14 inch square (the size depends on which set you order) and includes a velcro closure at the top. When the complete systems are packed in the bags, they take up the same amount of room as a pair of shoes! NEW! Bodylastics HEAVY DUTY Anywhere Anchor. The Bodylastics Anywhere Anchor will enable you to secure your Bodylastics to almost any stationary object. 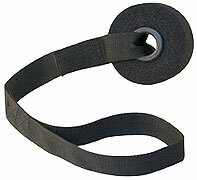 It is made with ultra heavy duty multi-weave nylon webbing, stitching and neoprene. 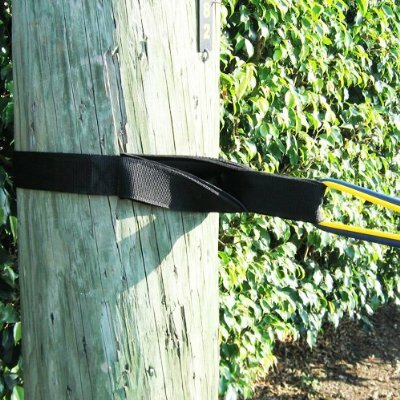 Easily secure it to medium thickness trees, poles, street signs etc..It brings a anywhere workouts to a whole other level. Don't have a cable crossover in your home gym? Bodylastics will work perfectly. If you get the TO Super Strong Man Edition, you receive two door anchors. In my gym I can attach one door anchor to the top of a door, and the other anchor I attach to my power rack, which is directly across from the door. I have incorporated Bodylastics into my weekly workouts. I now lift heavy twice a week, one upper body day and one lower. On the other five days I either do a kettlebell routine; a sandbag routine; walking on a treadmill with a weight vest; and now a cardio/bodylastics strength workout. As I continue to use the bands, I will keep this webpage updated as to how well they perform. Good resistance exercise, good quality, reasonable price, portable - usable for cardio, circuit and strength training. Nice video, good websites, good documentation, great customer service... What's not to like? Thumbs up for Bodylastics.